ENERGY | Gurly's collection of quotes, notes & video's made by great people who have been sharing their enlightenment through their words and actions. 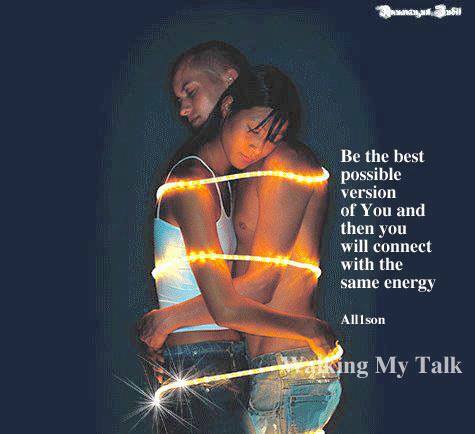 We can only attract into our life, people who are vibrating at a similar light energy frequency…so if you are running at 60 light watts and you met someone the same, then there will an instant connection. However, that additional 40% will be negative energy, and for one it maybe that they have spent a life being a victim, so that will be their weakness, the other may be a bully, so although in the beginning they may seem to match, overtime after the honeymoon is over that 40% comes to the table. unless both parties own their own behavior and fears. This entry was posted in Life, Love, Quotes, Self development and tagged ENERGY, Fear, Inner Peace, Law of attraction, Love and relationship by Gurly Hafsmoe. Bookmark the permalink.